The Magna Carta (originally known as the Charter of Liberties) of 1215, written in iron gall ink on parchment in medieval Latin, using standard abbreviations of the period, authenticated with the Great Seal of King John. The original wax seal was lost over the centuries. 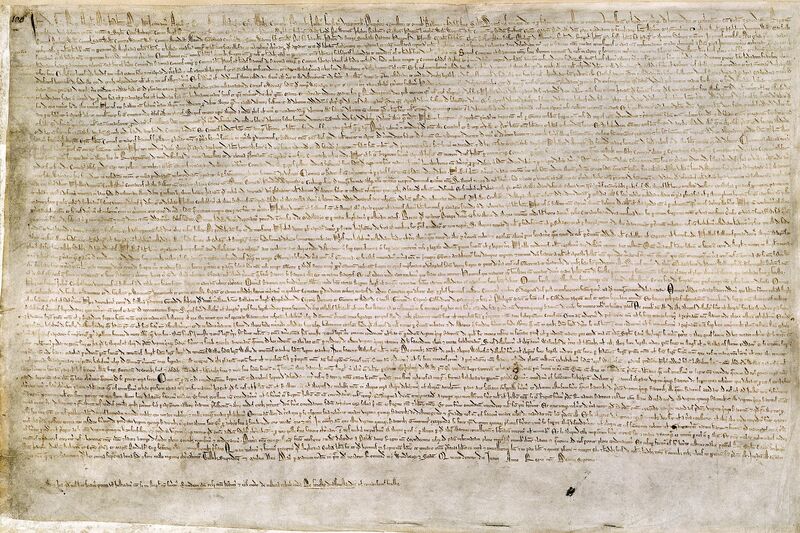 This document is held at the British Library and is identified as “British Library Cotton MS Augustus II.106” One of four known surviving 1215 exemplars of Magna Carta. Source Britishlibrary.png This file has been provided by the British Library from its digital collections. John, by the grace of God King of England, Lord of Ireland, Duke of Normandy and Aquitaine and Count of Anjou, to his archbishops, bishops, abbots, earls, barons, justices, foresters, sheriffs, stewards, servants and to all his officials and loyal subjects, greeting. Octocentenary! Truly, that’s a word you don’t hear everyday! Though most of its clauses have been repealed, the Magna Carta – celebrating its 800th anniversary today – still stands as a framework and rallying cry against the arbitrary use of political power. Signed June 15, 1215 by King John in Runnymede, (and not Runnemede, NJ, for those of us who have watched too much local news) this medieval document was composed as a peace treaty between the king and his subjects. “No free man shall be seized or imprisoned, or stripped of his rights or possessions,or outlawed or exiled, or deprived of his standing in any other way, nor will we proceed with force against him, or send others to do so, except by the lawful judgement of his equals or by the law of the land. See excerpts of the remaining clauses here. 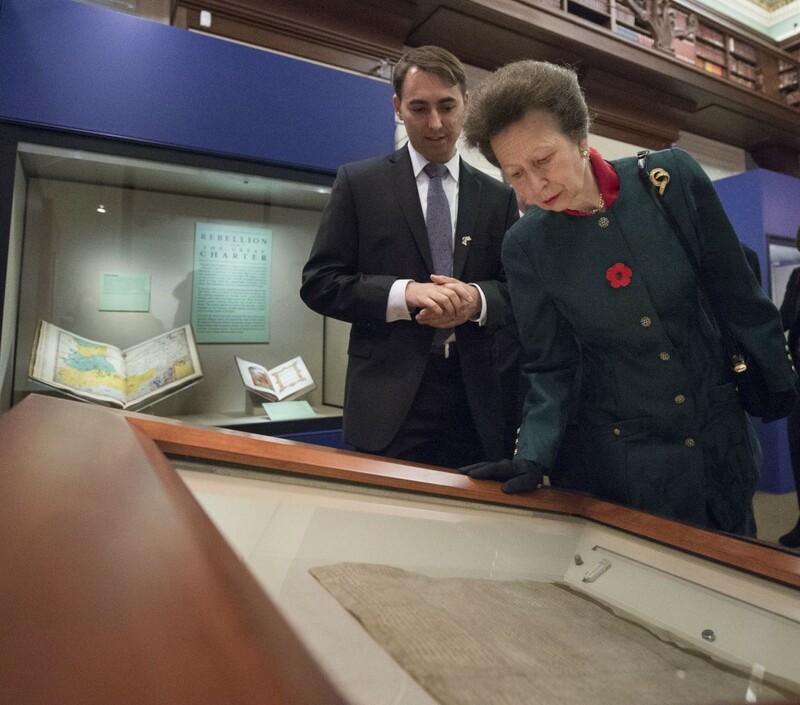 Can one still view the original Magna Carta? Yes, If you happen to find yourself in Merrie Ol’ England, you can visit one of three original parchments of the document, or several other locations with amended or later versions. In fact, last week, Princess Anne officially reopened Lincoln Castle after a “multi-million pound refurbishment” that included a new vault for housing that city’s original copy of the document. But if you’d rather save your pounds for a rainy day, you can still get up close and personal with the Magna Carta by viewing the extensive array of Falvey resources gathered by subject librarian for political science and geography, Merrill Stein. 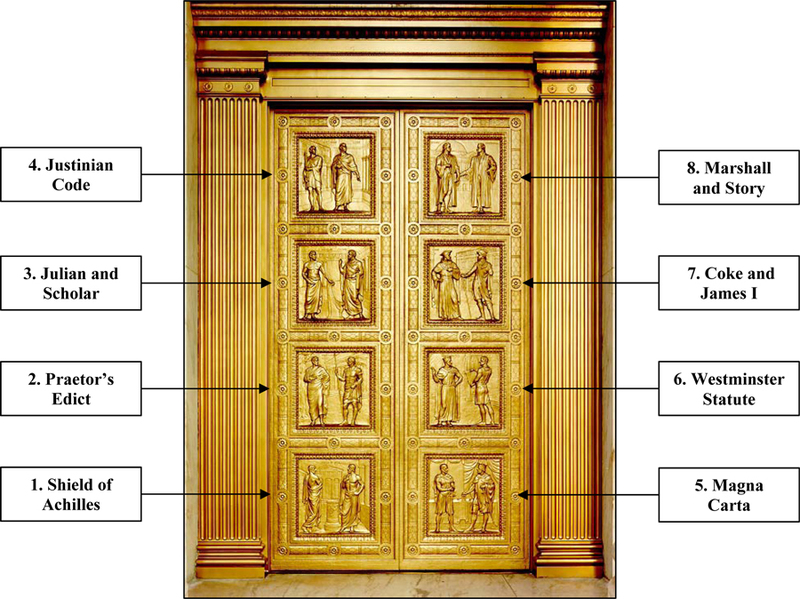 On the famous bronze doors of the Supreme Court in Washington DC, there are eight images; three are dedicated to the Magna Carta (5,6 & 7). Full text of the document and good explanation of the document’s relevance and history from Fordham University. Full text with annotations; an ed doc. 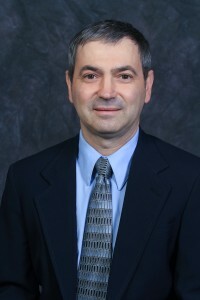 Dig Deeper links provided by Merrill Stein, subject librarian for political science and geography. Find Merrill’s contact info here.